Singer songwriter Donna Ulisse and guitar virtuoso Bryan Sutton are preparing to team up for their second studio effort on the Hadley Music Group label. The album will be Ulisse’s eighth release on the label. Sutton was at the helm of production for Ulisse’s 2013 release Showin’ My Roots which was her first album to feature mostly cover material as she paid tribute to many of her musical heroes. Ulisse, who has been nominated as IBMA Songwriter of the Year for the past three years in a row, will be turning to her own vast song catalog once again for this new album. She handed Sutton nearly sixty songs to sift through and they recently narrowed it down from twenty to a final twelve in a recent pre-production meeting. Bryan Sutton is one of the most sought after session acoustic guitarists in Nashville, a member of the band Hot Rize as well as a recording artist in his own right on Sugar Hill Records. His latest release “Into My Own” is nominated for a Grammy in the best Bluegrass Album category. He was also voted IBMA’s Guitar Player of the Year in 2014. Ulisse is busier than ever as she continues to tour with her band The Poor Mountain Boys playing festivals and concert venues. She also is experiencing more success than ever as a songwriter, having her songs recorded by other artists including recent cuts by the Larry Stephenson Band as well as Doyle Lawson & Quicksilver. 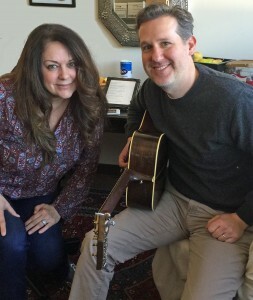 In 2014 she authored the book The Songwriter in Me: Snapshots of My Creative Process and launched a traveling songwriting workshop called Songwriting Escape. An official release for her new CD is being targeted for late spring or early summer.